The hike to Pulpit Rock near Stavanger in south west Norway is very popular, not just for the dramatic views at the rock itself, but also because the walk to get there is interesting and varied, through beautiful scenery. In norwegian it is known as Preikestolen or Prekestolen - meaning preacher's chair. Effectively closed during the winter because of ice and snow it is now well and truly open - with many hundreds of visitors yesterday enjoying the blue skies and signs of summer coming. 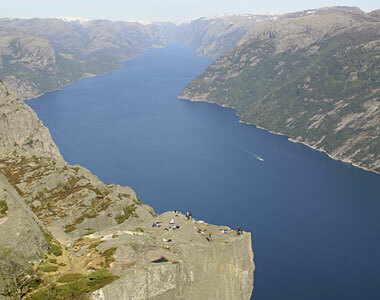 It is 3.8 km in a straight line from the car park at Preikestolhytta to Pulpit Rock, but more like 6 km each way to walk. The car park is at 270m and the rock is 604 m above the sea. It is reckoned to be a 2 hour walk each way - we think it is usually longer, but then we take a lot of photos and have rest stops. In the peak summer you can take the ferry from Stavanger to Tau and then bus to the car park - travel details from Stavanger here - we think the bus service should run longer. Although around 100,000 people will walk to Pulpit Rock this year, it is not an easy walk - make sure you have good shoes or boots, suitable (and varied) clothing plus food and drink. The path surface varies enormously, with flat rock, boulder fields, stone-paved sections, wooden raised pathways, to rough track and loose soil and rubble - which is why you need something good on your feet. A lot of work has been done on the path, especially around 8-12 years ago. The walk begins with a fairly hard climb for 500 metres from the car park up onto a plateau. Unfotunately this section is also the worst surface to walk on - loose soil and rubble - so think positive, it will get better! The next section is a lovely undulating path through pine woods looking down occasionally on the lake Refsvatnet. Many sections of the path have been "paved" with natural local stone, to reduce erosion and make the walking easier. This gives way to another climb up a wooded hillside. Many of the more difficult steps up have been made easier with extra natural stone steps along the way. From the top of this section you get lovely views over the Ryfylke, and can see Stavanger in the distance. If you do the walk later in the day this is a nice place to stop and watch the sunset, on the way down. The next section takes you across Krogebekkmyra - a flat wet boggy area that has been MUCH easier to cross since the raised wooden walkway was put in about 10 years ago. This is followed by another climb, up a boulder field through birch woodland. At the top (Neverdalsskåret) you are about half way to Pulpit Rock and the scenery changes - you're now on the mountains, not just walking	in the hills. The next section traverses along beside a slope and eventually up it, and over to a lovely sheltered area with several small lakes called Tjødnane which is good for a picnic stop, and you can swim in the lakes - but not too early in the year. Passing these you walk past a map that shows the red or green path split (keep on red) on bare mountain rock towards the narrow cliff path beside Lysefjord that leads to Pulpit Rock. Enjoy the views, take pictures, check out the vertigo you didn't know that you had, relax. Now do what most people do not do - go back on the green route, not back the same way. This takes you clambering up the rocks just as you leave Pulpit Rock and rejoins the main path near Tjødnane - just keep following those red Ts. You get a great view of Pulpit Rock from above (bottom left picture) and you can take a diversion to get pictures of Preikestolen and views up Lysefjord (centre bottom picture and top right picture). Skomakarnibba is near Hjelmeland and takes you over moors covered in fruit waiting to be picked on the way to an overhanging cliff view.